Our work family recently celebrated Christmas at LB Distillers. Curtis won the Ugly Sweater Contest (first row, far right). Thank you to all our Clients, Suppliers, Staff, Dealers, Family Members and Friends for making 2017 another successful year. We appreciate You! December 25th, closed, MERRY CHRISTMAS! January 1st, closed, HAPPY NEW YEAR! Be Careful of WHAT and WHEN You Post Family Photos! Travelling during the Christmas holiday season? There's nothing worse than coming back to a home that just had a break-in. Here's the TOP 6 HOLIDAY SECURITY TIPS you can implement to protect your Home and Property while you're travelling. DO NOT advertise on Facebook or Instagram that you are on vacation. Social media is the equivalent of a diary in a glass house. You may think you’re letting your friends and family know you’re having a great time, but people often forget to change their privacy settings. Thieves will also know you are travelling. If you like to post photos - post them after you get back. If you lose a key, then get the locks changed. A better alternative is to eliminate keys altogether by installing an alarm.com smart lock with built in keypad. Ask all strangers for identification. The person who is “lost” and looking for directions could actually be a burglar checking to see if someone is home. Never hide an extra key outdoor - especially underneath a mat or on top of a light fixture. This is the first place the bad guys look. Leave an extra house key with a friend or a neighbor. Again, a better alternative is to eliminate keys altogether by installing an alarm.com smart lock with built in keypad. For insurance purposes take photos of the contents of your home and keep all receipts in an off-site location. Great options are Google Drive, Microsoft Cloud and Dropbox. Write down the model and serial number of all electronics. This will come in handy for a future Police report and insurance claim. Door chains are easy to bypass. Install deadbolts. 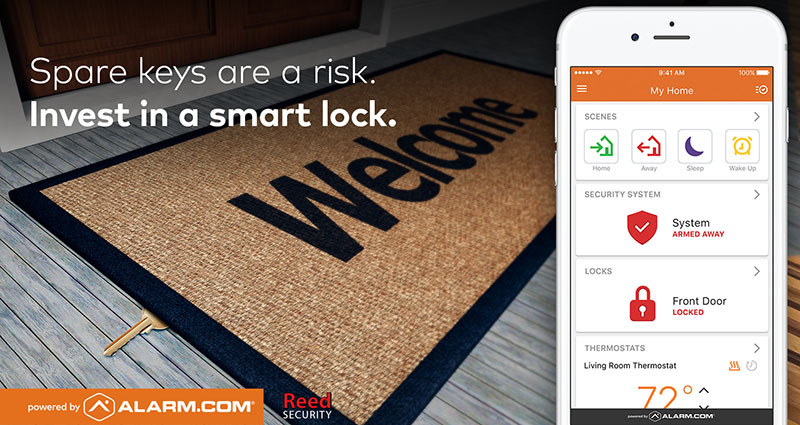 We have alarm.com smart lock options with built in deadbolts. Install window bars on all basement windows. They are a great visual deterrent and can be connected to a monitored home security system. Install a stopper or stick on all sliding doors and windows. You can find these at your local hardware store such as Home Hardware, Canadian Tire or Rona. Make sure all doors and windows are locked. Many burglars go door to door looking for targets that forgot to lock their front doors. For cabins, consider installing roller window and door shutters. Visit kimbel.ca to see samples. Burglars target unoccupied homes so keep your home well lit at night. Install timers that turn lights, radios and televisions on at different times. This gives the appearance that someone is home. A better option is to install alarm.com smart lights and smart appliance modules and setup on an alternating schedules. If you’re taking an extended vacation of more than a week, hire a student or service to shovel your driveway. Cancel the newspaper and have a friend or neighbour pick-up your mail. Park a vehicle in the drive-way. Don’t forget to lock the doors and remove any valuables. The insurance companies agree. You are 400% less likely to have a break-in and can qualify for an insurance discount of up to 25%. Call the Police from your mobile phone and wait. Do NOT Sign Up with Door to Door alarm companies with Limited Time Offers. Before you know it you will be on the hook for thousands of dollars with a company that doesn't have a local office. Many door to door alarm companies have summer programs (May to September only). After that good luck. Be sure to search Google for reviews and ask friends and family who they use for home security. 1. China has the largest population in the world with nearly 1.4 billion people. People are Everywhere - both the sidewalks and the streets are congested. Be prepared to be bumped into and race to the front of the line. 2. Huge growth in construction. It's common the see clusters of construction cranes of 20 or more at one development (we lost count of how many developments we saw). Apartment buildings are built at record speeds to house the growing population. 3. China is the manufacturing mecca of the world and exports more than 2 trillion USD a year. All the manufacturing has a side effect - a light to heavy smog in the cities we visited. 4. The Chinese people work hard, but about the same as the average Canadian worker. Both work about 2000 to 2200 hours a year. 5. Chinese elementary and middle school students outwork Canadian students. The school day runs from 8am to 4pm. After dinner its 1-2 hours of daily homework. 6. You are unable to use FaceBook, Instagram, Google Maps, Gmail, YouTube and several other web sites. 7. Don't feel too bad. Over 963 Million Chinese people use the WeChat app for social media and for digital payments. 8. Baidu is the Google of China and has an 82% market share . A censored version of Google has a 10% market share in China. 9. The Chinese people are technologically advanced and use their smartphones constantly (including when we were almost run over by a moped). 10. How many security cameras can you count at this Shanghai (population 25.2 million) intersection? CCTV cameras are EVERYWHERE in China and you definitely have the feeling that you are being watched. 11. However, you also feel safe. Where is all the data stored? How is the data being used? 12. There is a shortage of factory workers in China and employees have a choice on where to work. 13. Made in China 2025 is a government lead initiative to use Robots and Artificial Intelligence (AI) at factories to keep production costs low as labour costs increase. What are we doing in Canada to stay competitive? 14. We visited the head office of our partner Hikvision in Hangzhou (population 9.2 million). Hikvision is the largest video surveillance manufacturer in the world. 15. In 2016, Hikvision annual sales were 4.6 Billion USD and they currently have 20,000+ employees (9,000 are engineers). 16. Proud members of the Hikvision North American Support Team were gracious hosts and provided V.I.P. treatment all day. They were happy to showcase solutions and answer our questions. 17. Visits to the Hikvision head office are paid for by the customer. 18. We were impressed with the Hikvision showroom where there was a strong emphasis on Applications - using technology to solve problems. Smart Facial Detection technology predicted Virgil's height +/- 3 cm. 19. The Hikvision factory has more than 2 million square feet and manufacturers 100,000 security cameras a day. That's over 36 million security cameras a year! 20. We weren't allowed to take pictures of the inside for privacy reasons. 21. You can see the Hikvision artificial intelligence strategy at work as little orange self-driving, self charging robots move products from assembly lines to storage areas (Hikvision manufacturers the robots). 22. The robots complement factory workers who work a regular 8:30am to 4:30pm shift and live in company-provided apartments right next door to the factory. 23. At the employees choosing they can return to work after dinner for some overtime. We Help Families Feel Safe and Connect Them to Their Homes. We also Help Businesses Reduce Theft and Re-Gain Control. Contact Us today for a Free Security Evaluation or to find out How We Can Help You. We've added some new *$0 Down plans with $0 Equipment + $0 Installation. It's never been easier to Upgrade, Switch Over from a competitor or install a New Smart Package at your Home or Business. $0 Down Packages range from $39.95/mo. to $69.95/mo. (We do not provide pricing on our web site). Instead we offer a No Obligation, Free Security Evaluation with a Reed Security Consultant. We carefully listen to your needs and wants and walk through your Home/Business and point out how intruders can gain access. Then we share options on How to Properly Protect You and Help You Feel Safe. It only takes 20 minutes. To arrange a No Obligation, Free Security Evaluation with a Reed Security Consultant Click Here. A 48 or 60 month subscription is required. Stay Connected to Your SmartHome with apps for Apple iPhone and Android smartphones. Stay Connected to your Smart Business with apps for Apple iPhone and Android smartphones. 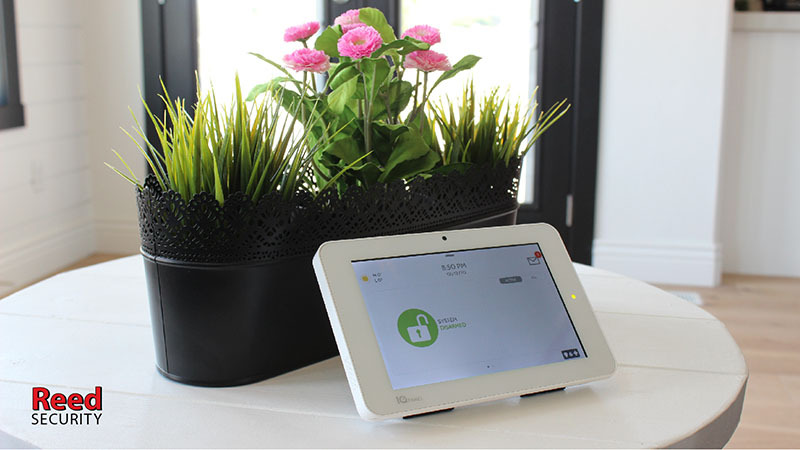 The IQ2 is the Smartest Security & Automation System on the Block. Comes with 7" HD Touchscreen and 5MP camera for disarm photos. Stay Connected to Your SmartHome with apps for Apple Watch. 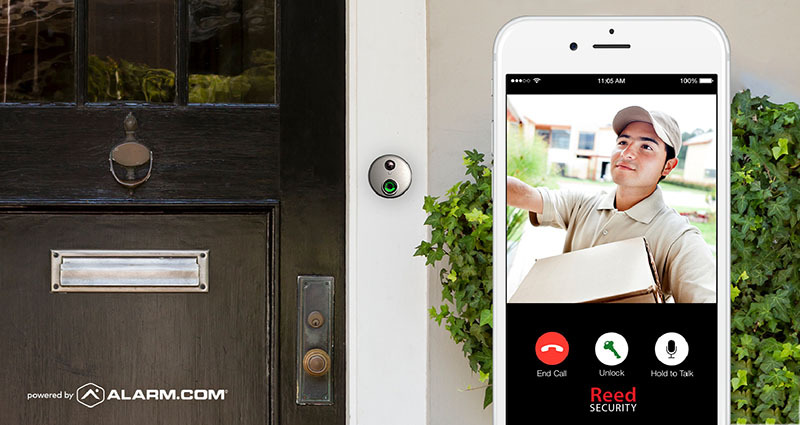 See & Record Who's At the Front Door with a ReedHD™ Wi-Fi Doorbell Camera. Comes with Alarm.com Cloud Storage. Install ReedHD™ Hi-Def Cameras to Keep an Eye on Things While You're Gone. Comes with Alarm.com Cloud Storage. Remotely Control SmartLocks + No More Lost Keys! Control Your Garage Doors with a Smart Garage Door Controller. Control Your Lighting with a Smart Light Bulb. Setup Your Smart Lights on a Schedule such as Turning On Before You Arrive Home. Save on Heating and Air Conditioning Costs with a SmartHome Thermostat. Adjust the Temperature via SmartPhone apps. Each year Brad Lavertu and his friends spend hundreds of hours creating the Hampton Village House of Horrors for the community to enjoy. When they started the project nine years ago 200 people visited. It's getting bigger and bigger - last year over 4700 people visited. The best part is they've given away almost $8000 to community groups or charities. This year the House of Horrors is collecting donations (suggested $2) for the Ernest Lindner Playground Project and Brainsport Winter Boots for Kids. Reed Security donated the use of a ReedHD™ Hi-Def camera system to capture some Ghosts and Spooktacular reactions.